A few weeks ago I was thumbing through an old fake book looking for a tune when I chanced on a bebop head by David Blumberg named “Joe Maini.” Instantly I was transported back to the year 1975 when, as a struggling young 28-year-old jazz saxophonist, I was living in low rent housing off Woodbury Avenue in Portsmouth, called “SeaCrest Village” at the time. I had been through an emotionally rough patch with a broken engagement and drug addiction and was licking my wounds and trying to recover by focusing on practicing and doing gigs and odd jobs to get by. My roommate, Dave, was a jazz pianist who happened to be dating a very attractive young lady from Barrington, whose name was Tina Maini. When Tina discovered I played the alto sax, she told me that her father had been a jazz alto player, quite well known in his time. A little research revealed an impressive resume: Back in the 1950s and early 1960s, Joe was one of Los Angeles's busiest and most distinctive studio musicians, sitting next to Charlie Parker in Gene Roland's Band That Never Was and recording with Clifford Brown, Shelly Manne, Kenny Drew, Zoot Sims and many others. Maini also appeared on dozens of major small group and big band recordings throughout the decade, including the I Want to Live soundtrack, Terry Gibbs's Dream Band, and the Ray Anthony and Bill Holman big bands. Tina brought some of his recordings to the apartment, and we sat around one night listening to some incredible alto sax playing, getting high and reminiscing, and that’s when I learned that there was a dark side to the story as well. The west coast music scene in the 1960s was notorious for the toll the swinging, drug-using lifestyle took on musicians (the stories of Gerry Mulligan and Chet Baker come to mind), and Joe was no exception. Word on the street was that after a bad fight with his wife, Joe had taken a gun and shot himself in the head at the home of a friend. Another version had him playing Russian Roulette in a devil-may-care state of mind. Tina, however, was quick to point out that none of those rumors were true, and that it had been an accident. I never really learned the details at the time, however, because an incident occurred that made me decide to move out of the apartment and seek shelter elsewhere. Dave had approached me to play some jazz with his group at a birthday party for Tina’s mother, Sandra, at their house in Barrington. I had another gig that day but agreed to stop by later and sit in with his group. It was probably 10 pm when I pulled up to the mobile home deep in the Barrington woods. Christmas lights were strung up on the trees, and the smell of pot wafted out to the street as I approached with my horn. The sound of jazz floated on the air from a patio behind the trailer. The guys greeted me enthusiastically and I jumped in on the next tune, playing for maybe an hour before we took a break. As I put my horn down, Tina approached me and told me her mom would like to meet me. A beautiful dark-haired older woman, smelling of patchouli and dressed in some flowing garment, enveloped me in a warm embrace, kissing me on the cheek. I felt myself stiffening unconsciously at the unexpected intimacy, but graciously managed a muffled “pleased to meet you.” Tina’s eyes were bright and her face flushed. She told me that her mom really liked my playing and wanted me to have some special refreshment. Would I come with them inside? The hair went up on the back of my neck. I mumbled some excuse about needing to get to another gig, grabbed my horn and walked quickly to the car, leaving them both standing awkwardly watching my departure. To this day I am not sure why I felt so conflicted, although later Dave told me that Tina’s mother was reminded of her departed husband that night. Apparently I was about the same height and build with dark hair, and played jazz alto sax well enough that perhaps for a moment she was willing to forget our age difference. But I was uncomfortable around Dave and Tina after that and soon decided to move out of the apartment, since Tina was a frequent visitor. I moved to Dover and the change of scenery proved beneficial to me; over the next few years I cleaned up my lifestyle, got a job in a health food store, practiced yoga, kicked my drug habits and became a teacher, composer and arranger to complement my playing career. “The late 1950s was a crazy time on the West Coast. Every musician seemed to be high, drunk or loose most of the time—except when it came to playing and recording. Despite my father’s drug habit, he never missed a gig or recording session. There was always a gathering or a jam session going on at our house in West Hollywood when I was young, and my father was infamous for being the life of every party. Sadly, drugs were a major part of his downtime and certainly contributed to his judgment at the time of his death. But drugs, most assuredly, had nothing to do with why my father was special as a musician or why he was loved and admired by so many. “In the spring of 1964, my mom was trying to get clean from her own drug habit. She also was struggling to raise my brother Giuseppe and me. To create space, she and dad would separate off and on, which was hard on us. Being apart was difficult on my parents. The week of my father’s death was one of those tough times, and I’m told my parents' most recent separation had him feeling a bit down. Consequently, rumors circulated after his death that he had committed suicide—despite the fact that he was in a great mood and joking around when the gun he held in his hand went off. “Let me set the record straight. Here are the facts concerning the night my father died, according to my mother, my dad's brother and alto saxophonist Ray Graziano, who was there: In 1964, Ray’s girlfriend Daphne lived with him, and my father was hanging out at their place after gigs to relax and party before heading home. One night Daphne thought she saw a prowler at the window. So my father and Ray borrowed a gun so Daphne could protect herself when she was home alone. My father was an outrageous prankster and went to great lengths to pull off a joke. Friends called him Joe 'Mainiac' for good reason. I remember my father once told me to play dead and brought me to my mom, who freaked out. Other times, my dad went way out of his way to make us laugh. One time he used a large pipe wrench to pretend he was tightening his nose. “When my father and Ray arrived back at Ray's place with the gun, my father started playing around with it, telling jokes and clicking the trigger, imitating a cowboy. “A few days later, late at night and after a gig, my father went back to Ray's house to get high. In the interim, Ray had purchased bullets and loaded them into the gun. Nobody knows why my father wasn't told about the gun being loaded, but when people are getting high and it's late at night... My father picked up the pistol and started telling a joke. He waved the gun around, and it went off accidentally. The bullet cut just under his ear and across the back of his neck through his spine. If that bullet had been just a millimeter off, he would have lived. “Ray and Daphne rushed my father to the hospital, and he died soon after. I remember being at the hospital when Grandma Maini, Joe’s grieving mom, screamed, "Murderer, murderer!" at my mother while I held my little brother crying in my arms. It was really rough. A short time later, my father’s parents reached out to us, apologized and were wonderful grandparents to my brother and me. “I also remember my father’s open-casket funeral and the horn they buried with him, one of Charlie Parker’s, I was told. From what I’ve heard, everyone in the jazz world on the West Coast was there that day. Soon after my father’s funeral, his musician friends held a 12-hour memorial concert at Shelly's Manne-Hole. Everyone contributed generous amounts of cash, which was placed into a trust fund for my brother and me. The money helped us enormously when we turned 18, and we are so grateful for that. “I have no idea what happened to Ray Graziano or Daphne in the years that followed. As for my mother, she kept us isolated from the gossip and media. She moved us to an out-of-the-way city on the East Coast. To make ends meet, my mother worked at all kinds of jobs, from construction and decorating to teaching art to young children. I lived with my mom off and on most of my adult life, and we had an intensely close relationship. She passed away 20 years ago, still in love with my dad and somewhat broken-hearted. “Since my father’s death, I have worked as a jazz vocalist and musician. My brother, my son and daughter as well as my grandchildren all have the talent and the music in them. My brother Giuseppe has become a painter and blues-harp player in New Hampshire. In so many good ways, he is just like his father. My son played sax like a natural and now is a sculptor in New York. My daughter has recorded in Europe. At any rate, I can definitely recommend Marc’s blog to jazz aficionados; it contains articles and reviews about numerous jazz players and singers and is well written, with many rare photographs. Hope this story helped spark your interest! 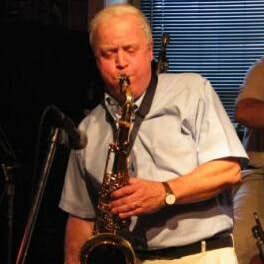 Charlie Jennison is a saxophonist, a flutist, a pianist, a music educator, and an arranger. He’s also past President of the Seacoast Jazz Society.